Mounting Correctly: Needless to say, correctly mounting your gutters to the fascia of your roof is one of the most critical parts of gutter installation. The primary consideration is correctly spacing the mounts or hangers, specifically not spacing them too widely. Different gutter types will vary in their spacing needs, but you’ll usually want to leave no more than three feet between your hangers/mounts. When in doubt, attach your hangers closer together rather than farther apart. If using segmented gutters, you’ll want to attach hangers near the gutter seams as these parts are inherently prone to stress under weight. Improper spacing can result in everything from leaks to gutters simply falling off of your house. You want to get this part right! Gutter Type: Unless you’re installing copper gutters, in which case we’d recommend hiring a professional, most gutter materials (aluminum, steel, vinyl) are painted to match the home that they are being installed on. Aesthetics aside, the main consideration is durability. The most common gutters are K-Style (as opposed to half-round) Aluminum. In the case of aluminum gutters we’d recommend going with at least the industry standard of 26 gauge, if not the safer option of 32 gauge. A thicker gutter means a more durable gutter, better able to withstand the stresses of heavy rains and icing. Locating the Downspouts: Incorrectly locating downspouts can prevent your gutters from moving water correctly or result in potentially damaging amount of water in unwanted areas around your house. As such, it’s important that you plan your downspout placement in advance. Be sure to route water to areas with decent drainage. Rain barrels can be a great alternative to simply routing water away from the foundations of your house. Getting the Pitch of Gutters Correct: Installing your gutters at the correct pitch is crucial to a successful gutter installation. If the pitch is too steep, you’ll have visibly unclean lines on your house. If it’s too shallow, water won’t flow to the downspouts correctly causing all manner of problems from insects & debris to gutters that simply rip off with any weight strain. A good rule of thumb is ½ to ¼ inch of height per 10 feet of gutter (The flow of water will vary depending on the number and placement of downspouts). Be sure to use a level to ensure the pitch is correct during installation rather than finding out about a problem the hard way. Using string and a pencil to mark the entire slope is a good method of ensuring you’re where you need to be as you’re hanging each section. 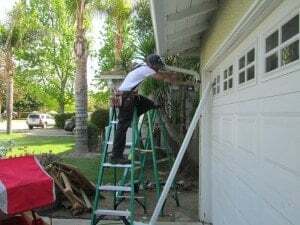 If you’re looking for help with Rain Gutter Installation in the Los Angeles area, Rain Gutter Pros is happy to help!